Jameson merchandise will please the most demanding Irish whiskey enthusiast. Our Jameson gifts include t-shirts along with rugby shirts and shot glasses. Several of our Jameson gifts feature their Irish whiskey motto of Sine Metu that translates to without fear in Latin. The Jameson merchandise at The Irish Gift House are officially licensed products. 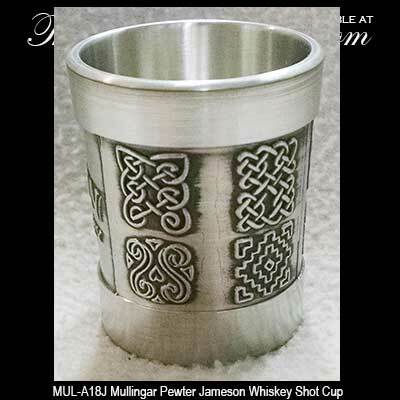 This Jameson shot glass is made of Irish pewter and it is enhanced with Celtic knots. For similar selections you may also wish to browse our assortment of Guinness gifts along with our collection of Guinness t-shirts. For your convenience The Irish Gift House has compiled all of our Irish rugby shirts on one page and naturally we also have a page that is dedicated to all of our Irish t-shirts too. We also have a complete collection of Irish shot glasses that are In addition to our Jameson shot glasses that are featured in this section.